The silent, space-saving PANEL18 is designed to act as front-end interface for rugged, secure, or sensitive environments, where reliability and quality are key issues. The PANEL18 expands MPLs Panel-PC Family of compact, easy-to-integrate and multi-functional All-in-One solutions. The product is particularly designed and assembled for none standard environments. This includes but does not limit to meet EN50155, MIL-STD-810 and or IEC 60945. 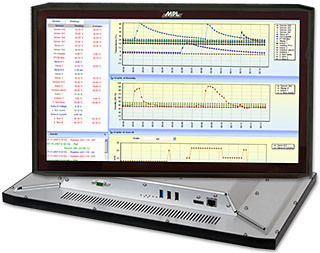 The "All-in-One" Panel PC solution combines a rugged 18.5" display with excellent optical and temperature specifications, an optional touch screen, and a complete range of low power CPU based embedded Single Board Computer (PIP & CEC) from MPL. It starts at an Atom Single Core up to i7 Quad Core. The front of the PANEL18 is IP65 protected with a joint free and hardened Schroff glass. On the back side, various PC interfaces are available (customizable connectors). Like all other MPL products, the PANEL18 requires for operation no fan. The solution is very flexible and expandable for basically all customer needs and requirements, regardless if it is GPS, Fieldbus, LTE, Bluetooth, or WLAN, just to mention just a few. The robust and front IP65 protected PANEL18 is the ideal solution as man machine/front-end interface for harsh applications like in Railways, Maritime or any other tough applications. Further as it is space saving, fanless and noiseless, the PANEL18 is the ideal solution for cabinet applications in telecommunication, kiosk information systems in Railways as well as Internet access points. Use of our reliable, long-term available Embedded Computer Boards out of the PIP and CEC product range. All boards are well equipped and offer the standard interfaces on board. We are not aligned to a certain display type, therefore please ask us in case you have specific needs. The below given values are from our used standard 18.5" LCD which is based on the Sharp LQ185M3LW01.